A few weeks ago we went camping in northern Michigan at Tawas Point State Park. It was beautiful! We had a great view of the bay. And a beautiful lighthouse to admire as well! We had a lot of fun and plenty of time for relaxation. It's so nice to just get away and do nothing but relax, have fun, and enjoy each others company. We had a little snafoo at the beginning of the trip with our van breaking down, but the Lord provided the knowledge and skill my hubby needed to get it fixed and we were good to go. It was a bit chilly with temps barely hitting the 70's, but I thought it was heavenly and the kids didn't seem to mind not sweating as they rode their bikes and played at the playground with new found friends. It was the perfect weather for a campfire! We had one at least twice a day (unless it rained). For Father's Day we bought hubby a grill thingamajig for grilling over the campfire so that's how we cooked our meals. We had hot dogs, hamburgers, pork loin, and a few other yummy recipes I'm going to share with you over the next two weeks. 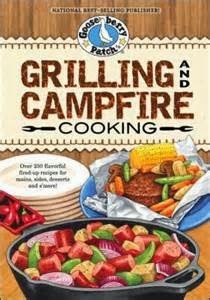 The kind peeps at Gooseberry Patch have given me a copy of this fun Grilling and Campfire cookbook to give away! There are so many yummy recipes! I dog-eared so many pages of recipes I want to try in the next few weeks, too! Cook bacon in large skillet or dutch oven over medium-hot campfire. With a slotted spoon, remove bacon to a plate and set aside leaving grease in the pan (we wrapped the cooked bacon in aluminum foil and sat it by the campfire to keep warm). Cook and brown the ground sausage removing the meat with a slotted spoon and cover to keep warm. Add potatoes, cover and cook until golden (cook about 3-4 minutes and then turn them over and cook another 3-4 minutes). Pour eggs over potato mixture and stir with a spatula until cooked to desired consistency. Stir in the bacon and the sausage and sprinkle with cheese. 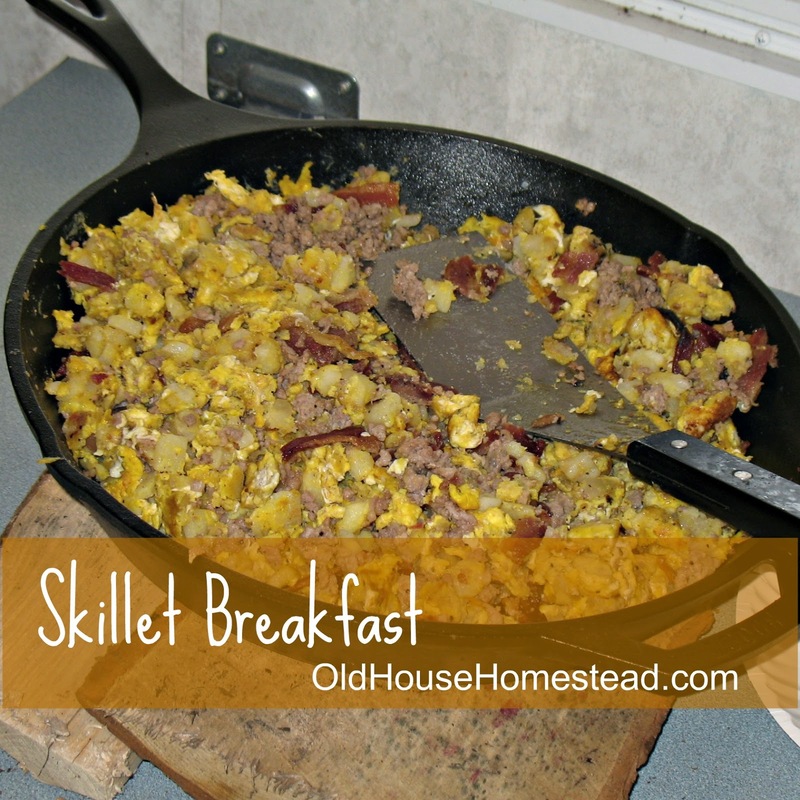 Remove skillet (or dutch oven) from the campfire and cover. Let stand until cheese is melted. Enjoy! One winner will receive a copy of Gooseberry Patch's Grilling and Campfire Cooking cookbook! Go visit our Etsy shop HERE. Leave the web addy in a separate comment. We just got a new RV and are so excited to be making camping memories. It is truly a dream come true! Each time we camp is better than the last as we learn to use and enjoy the RV! Cook hash browns as directed until almost done. Stir in roast beef and juice, onion, seasonings. Continue to cook until crispy. My favorite memory by the campfire is eating s'mores and playing board games with my whole family. I love the Fall / Autumn / Harvest -- Painted Wooden Typography Art Sign! I love the names of Jesus sign. Thanks for the chance to win! I remember the first time I ate a browned marshmallow! I was raised you lit it on fire, blew it out and then ate it! Now I love browning them then eating them! I remember the times we camped at my grandfathers farm by the river. As a girl we did this every summer for 3 months while my Dad would go to work from there we got to spend that time with my moms family on the farm, swimming, eating great food and playing with my Aunt Nancy who is only 3 years older then me. We often would go to the small pops store to get candy and a treat with grandma fisher. Such wonderful memories ! Family Rules painted wood sign, its great, love so many ! I shared on facebook at Linda Marie Finn Faithful Acres Homestead ! http://www.faithfulacres.net/old-house-homestead-giveaway-gooseberry-patch-grilling-and-campfire-cookbook/ Shared on my website today ! I put the giveaway on face book. I went on your esta account and love the sayings and I'm commenting. I went camping with my parents I haven't with my kids yet. I want to though. I love the Fall/Autumn/Harvest sign in the Etsy shop- so cute! My favorite memory is when I was a kid, and we were camping in a very old, beat up, half way converted into something else because some college guys had gone a bit over the top at some previous juncture, pop up camper. My dad's friend had rigged it for bare bones functionality. My brothers and I were sleeping in one of the wings and it was pouring slanted rain, and the wonderful pulley design gave out. Down we went, the whole thing tipped to one side and there we were head down like shoes in one of those over the door holders, wide awake, drenched, partly laughing, half screaming, partly snorting rain water. Thankfully, our heads were still about 6 inches from the ground. Unfortunately we were in sleeping bags that weren't waterproof. The crash and subsequent dog barking brought the adults and we had a speedy, yet tenuous rescue. Yep, memories are the stuff of life. My favorite campfire song is Take me home :) I love grilling and campfire! We didn't go camping much when I was a kid, but the one memory I do have is of all of us sitting around the fire talking. Family time leads to great memories. We made a wish and the Life is Better in Flip Flops... loved them both it was too hard to choose my favorite. My favorite camping memories are those of my childhood. My father was a police officer and would often work until midnight. He would come home and he and mom would pack the four of us girls up in the station wagon with the 'off we go kit' and we'd wake up at a campground for the weekend. The campground at Port Crescent, MI was my absolute favorite!